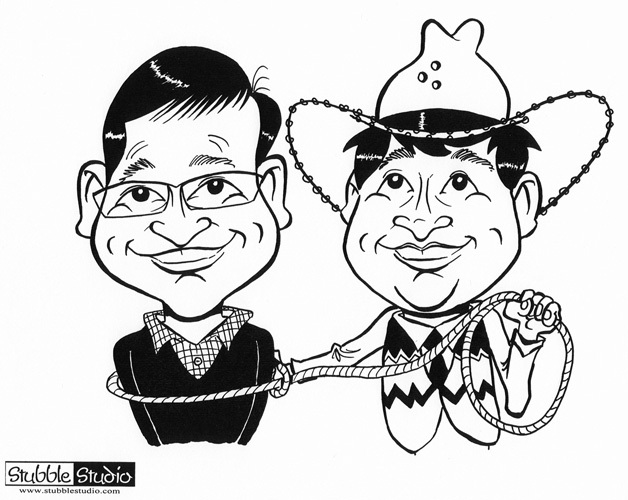 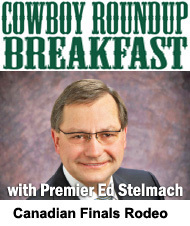 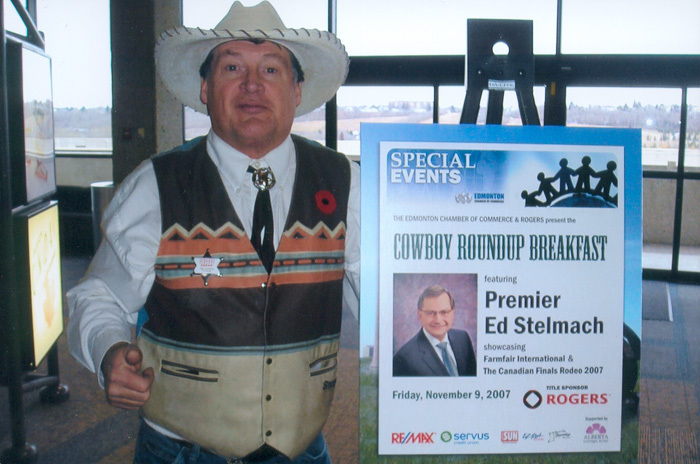 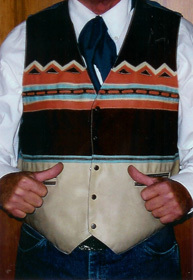 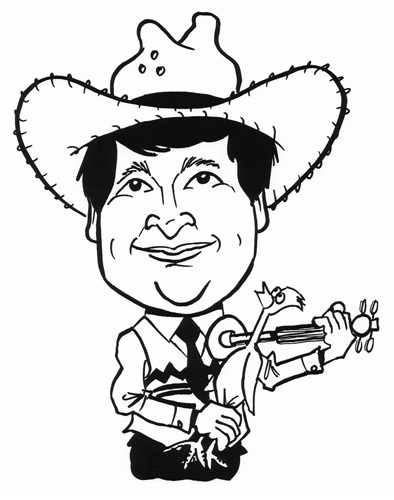 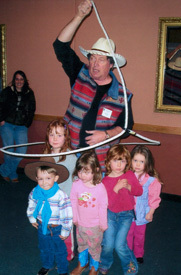 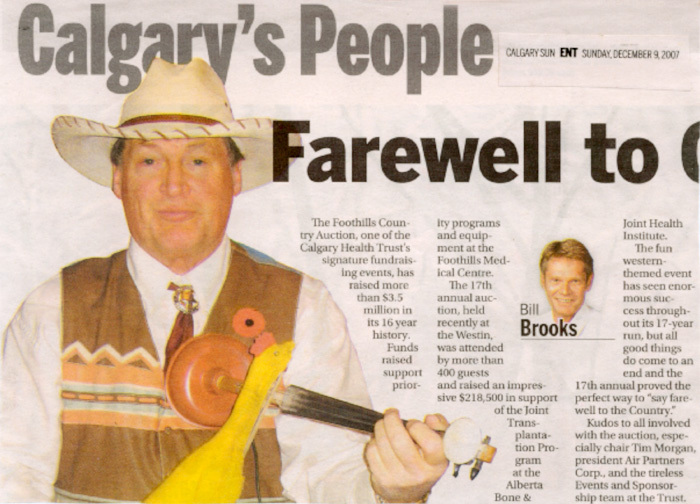 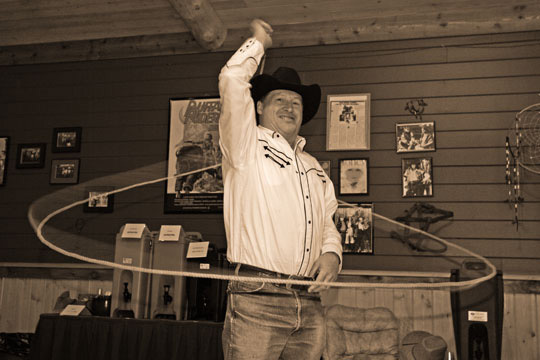 (403) 282-0361 BudEdgar@shaw.ca "Alberta's PREMIER Roper "
Ed Stelmach "in the loop"
"A show the entire family will enjoy." 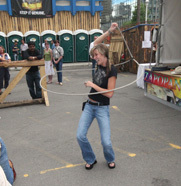 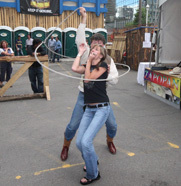 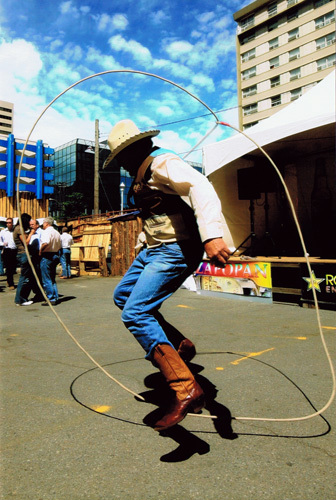 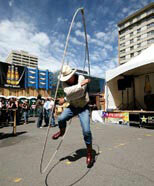 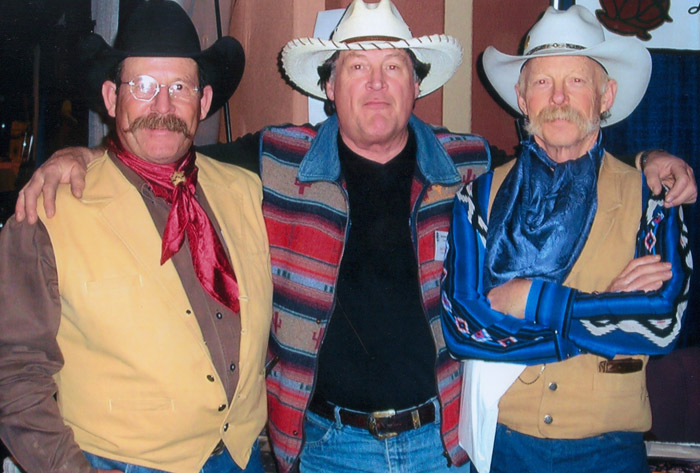 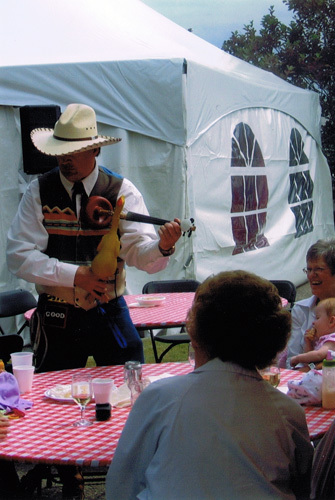 Corporate Events, Cowboy Festivals, Stampede Parties and other Venues. 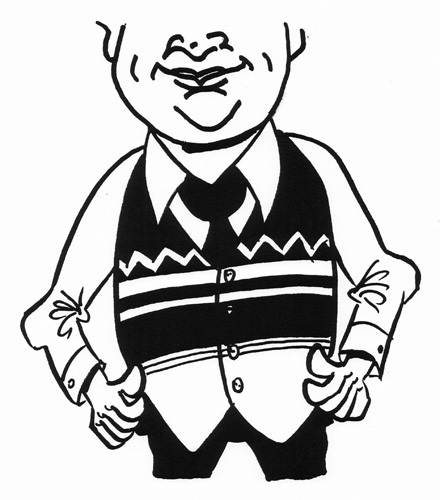 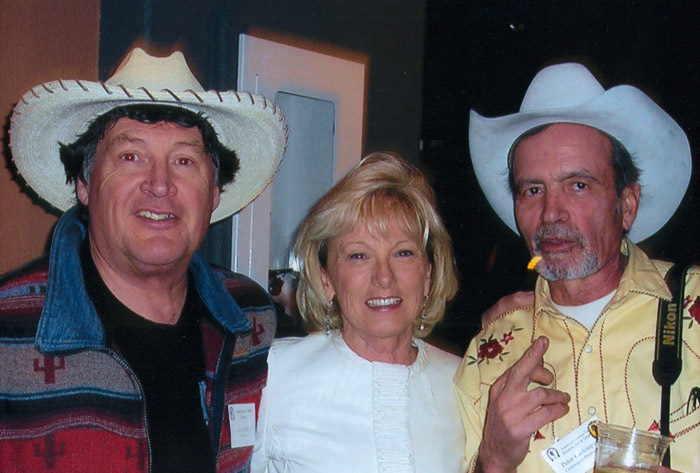 "Bud is a very funny man and that is truly a gift." 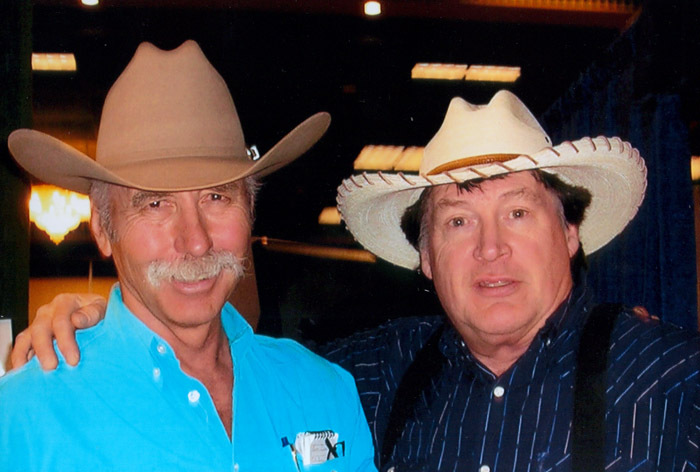 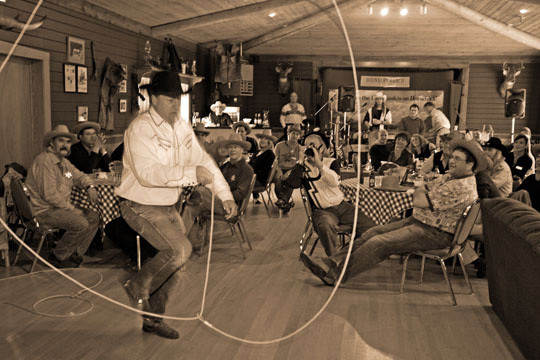 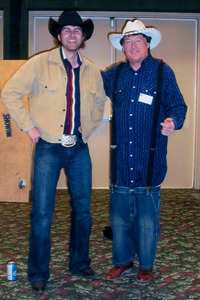 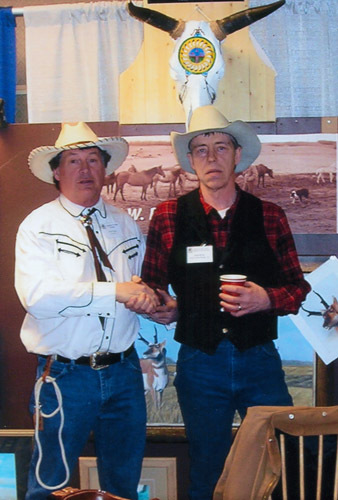 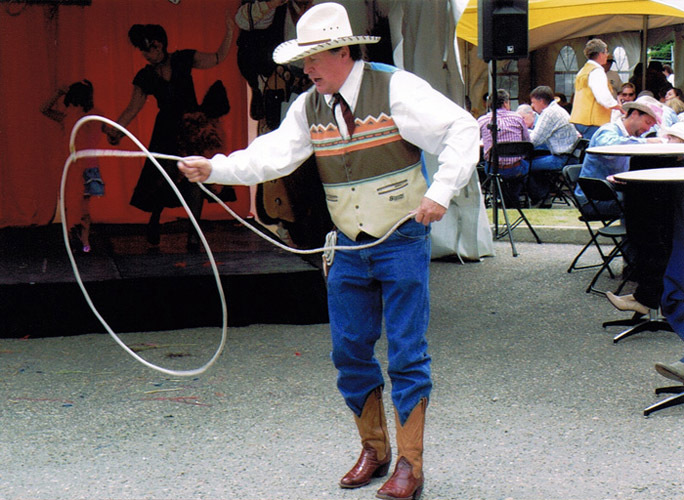 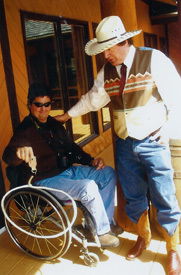 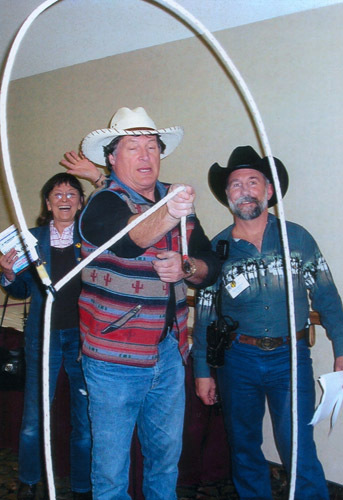 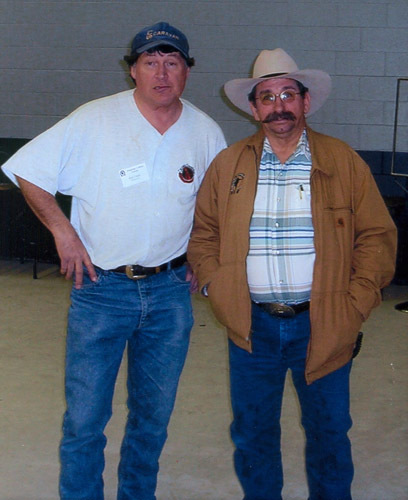 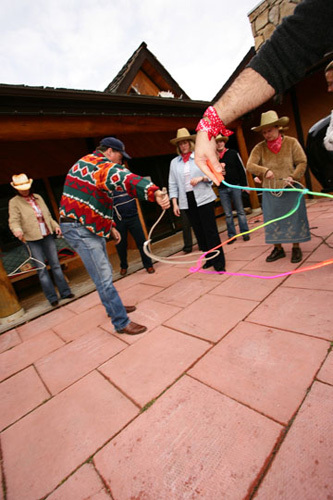 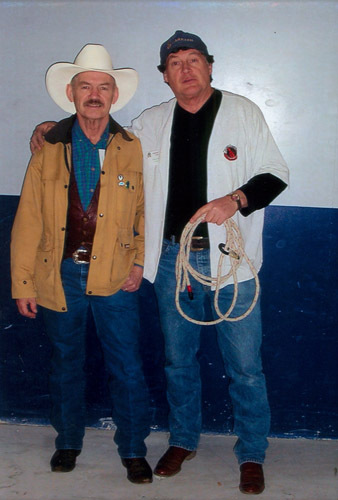 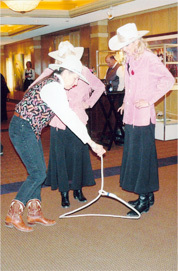 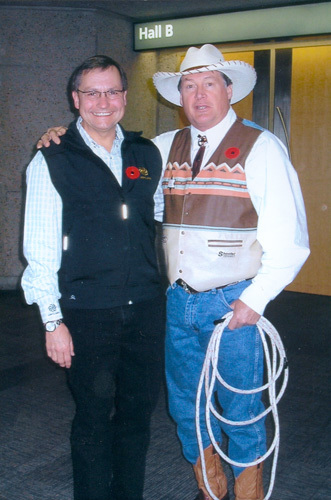 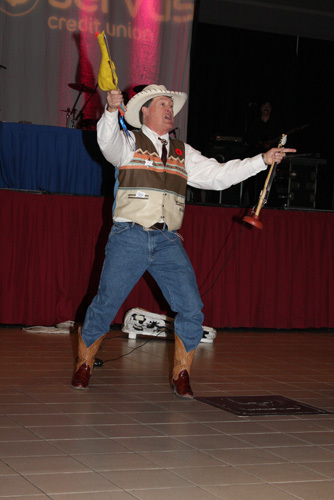 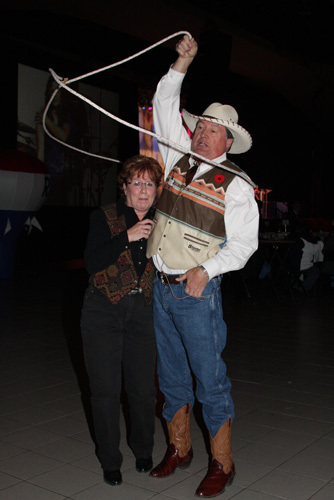 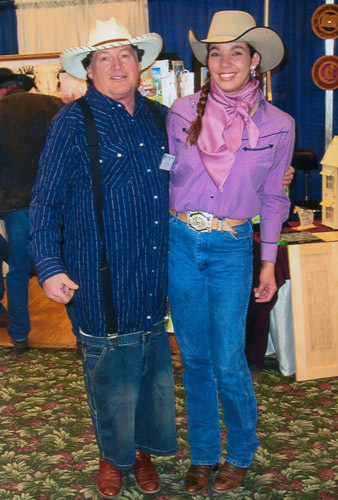 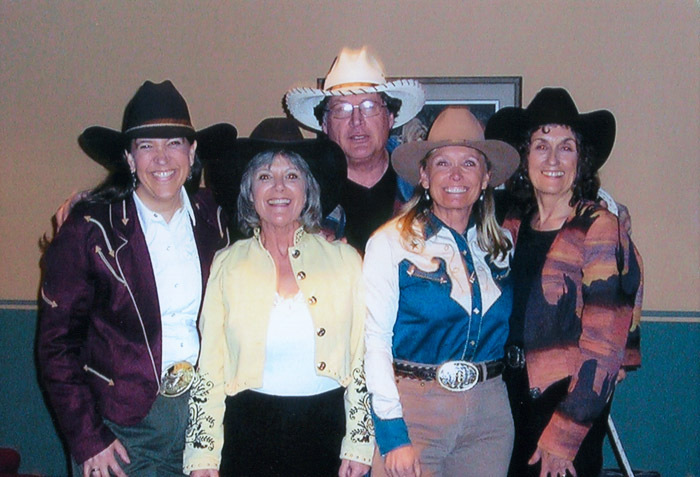 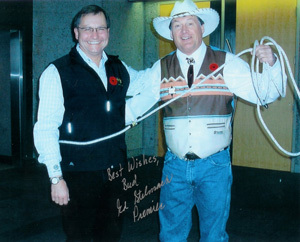 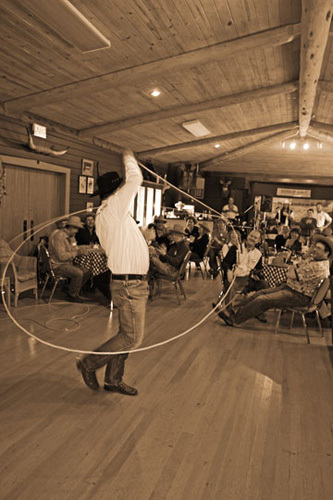 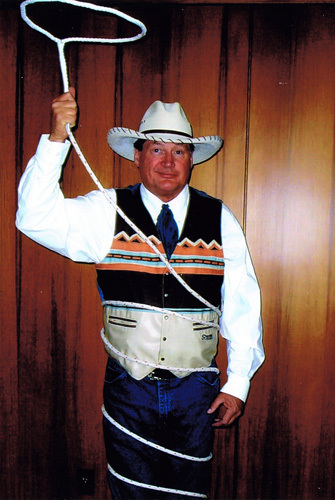 "Bud's trick roping was the highlight of our convention." 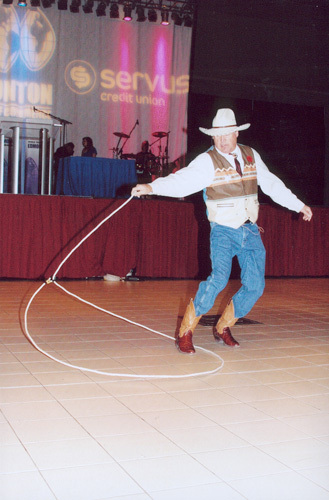 "We enjoyed his skills and entertainment." 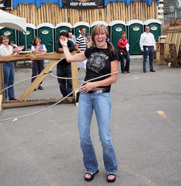 Bud has special 'easy-to-spin' ropes for people to try. 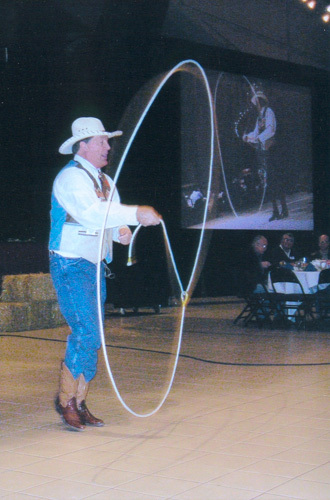 "Bud's trick and fancy roping, both impressed and inspired me." 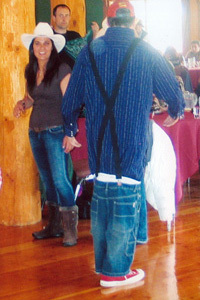 Bud is also available for strolling shows. 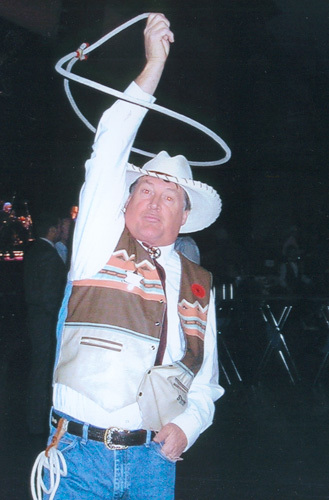 "Bud ..Yehaa..You're Fantastic, you made everyone smile...see ya next year..."
he raised the energy and ha ha level and we all need that." 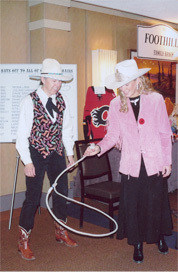 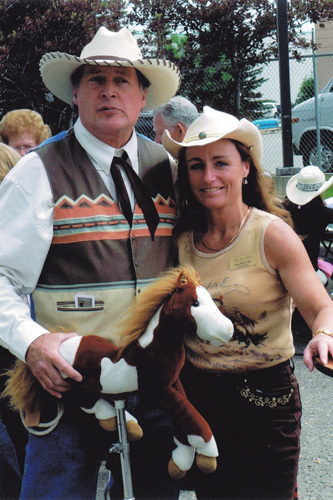 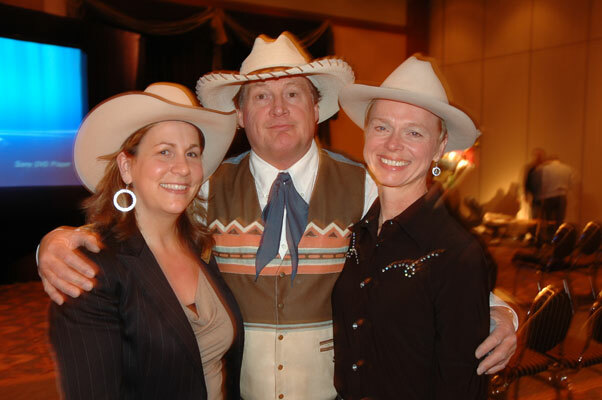 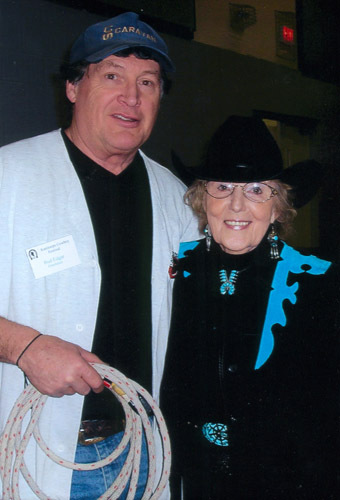 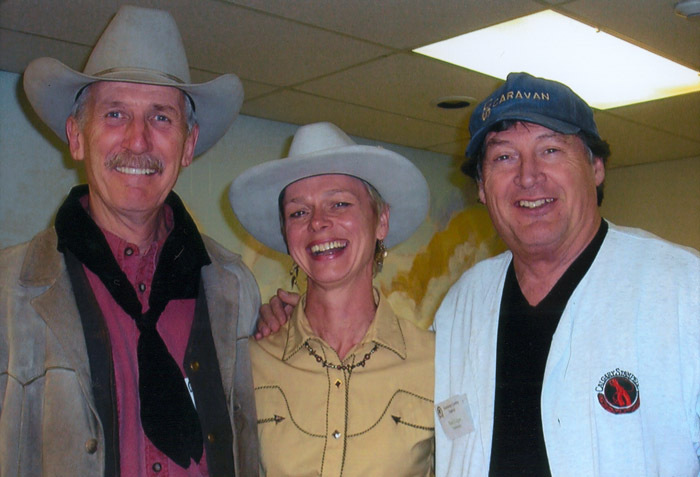 Victoria Austin, Calgary Stampede, Bud, Doris Daley, Cowgirl Poet. 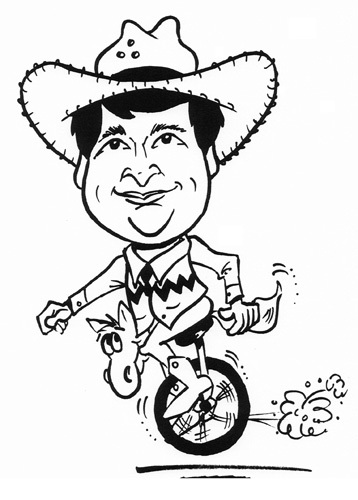 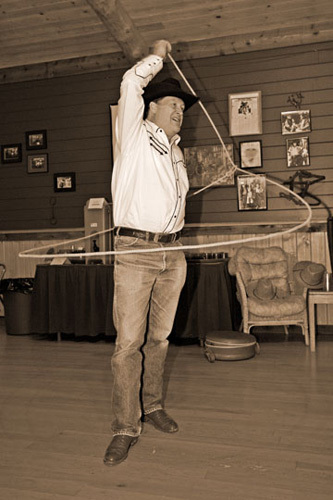 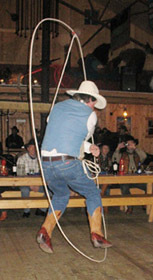 Trick Roping was made popular in Vaudeville by Will Rogers. 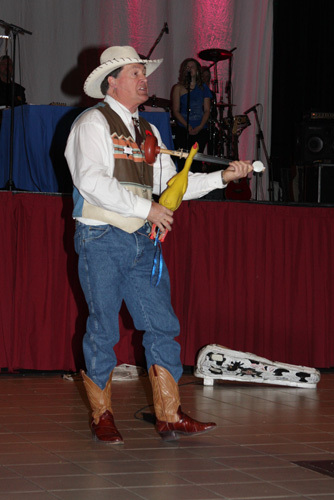 A fellow Vaudevillian and trick roper. 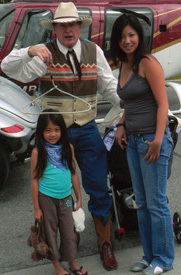 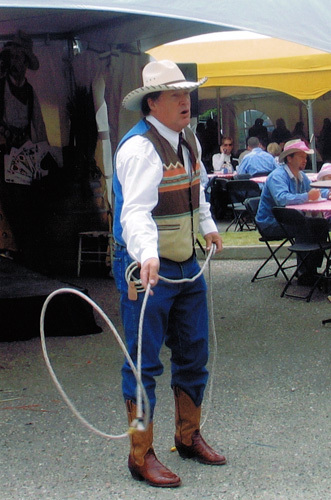 Guy Weadick helped start the Calgary Stampede. 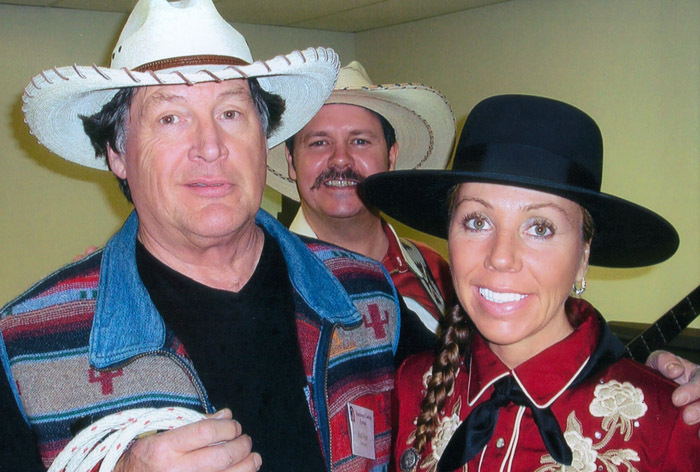 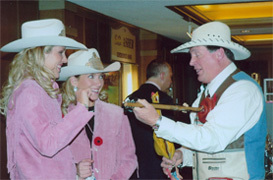 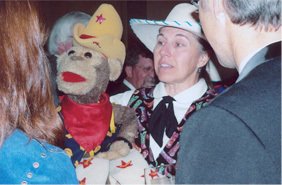 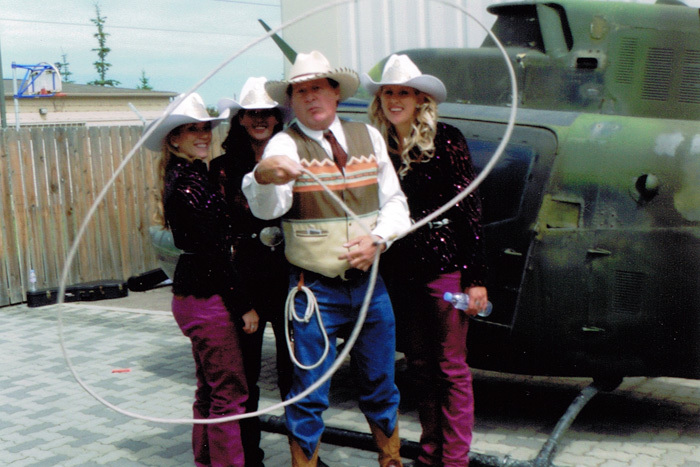 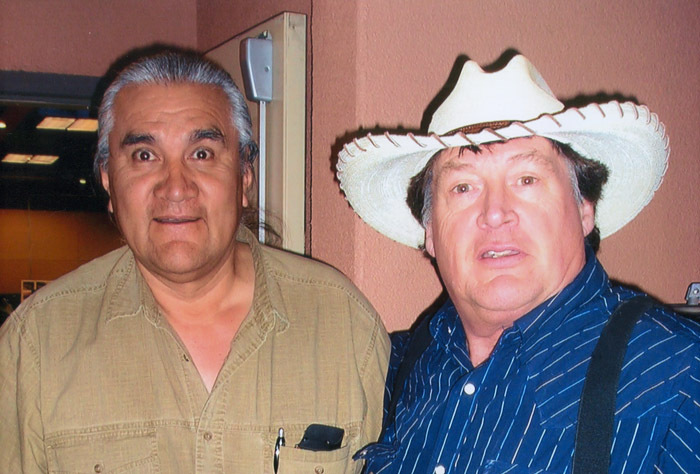 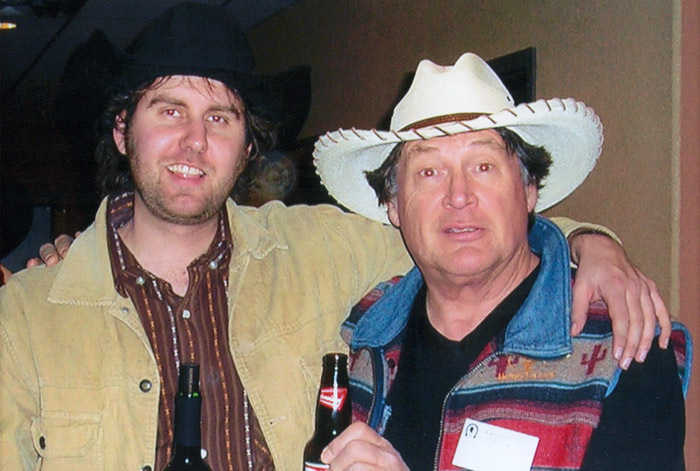 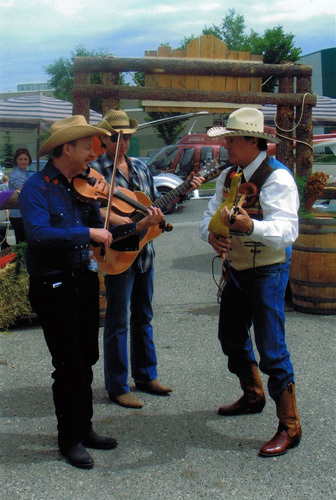 Bud performed at the stampede for eight years in a row. 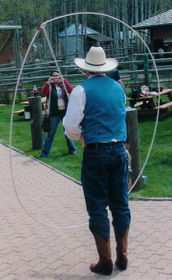 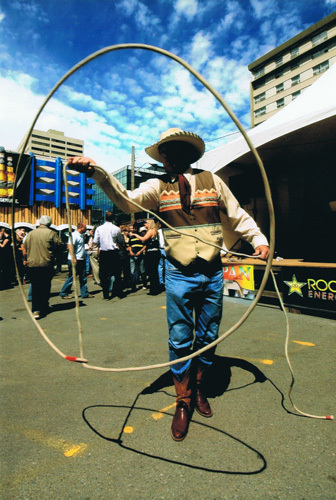 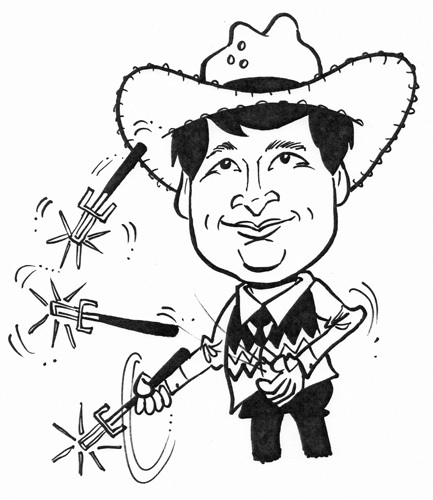 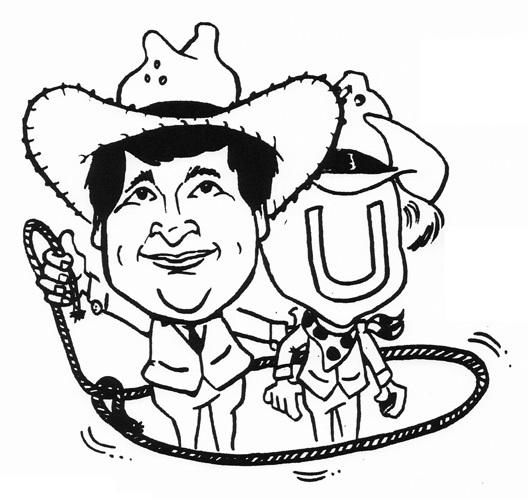 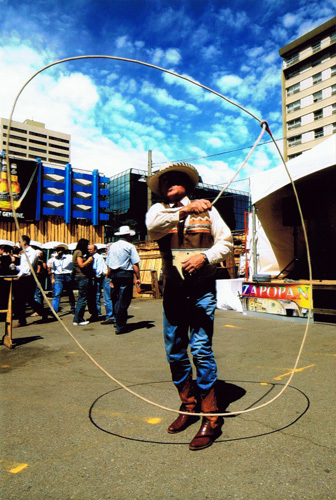 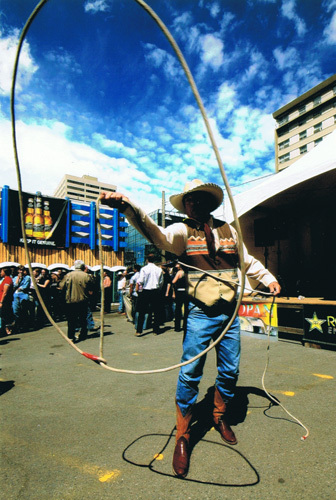 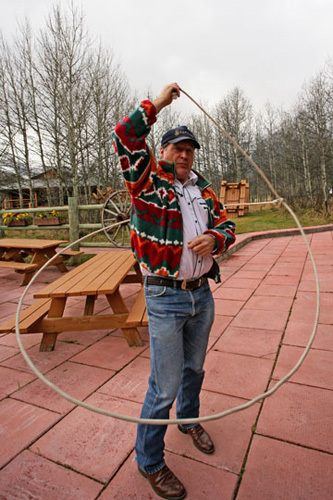 He is shown trick roping in their promotional video. 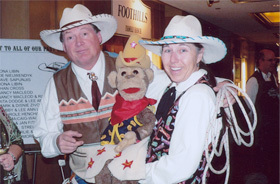 "Bud offers a very unique performance"
Emerald Sports and Gifts, Peter Duggan, Esquire, Pat Longhurst, Sheila Edgar, and Kamloops Cowboy Festival. 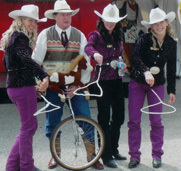 Special thanks to the Stampede queen and princesses. 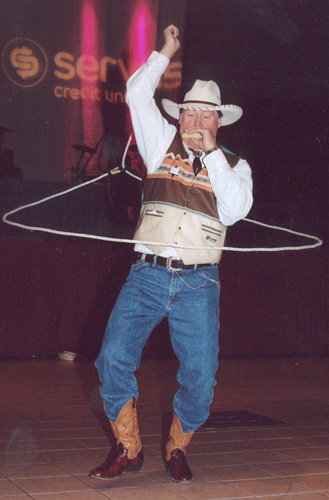 The Bottom Line: Bud is a professional entertainer. 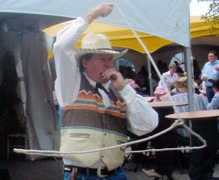 This is not a hobby or part time job. 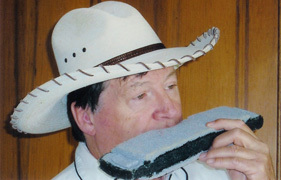 He works very hard at being the best he can. 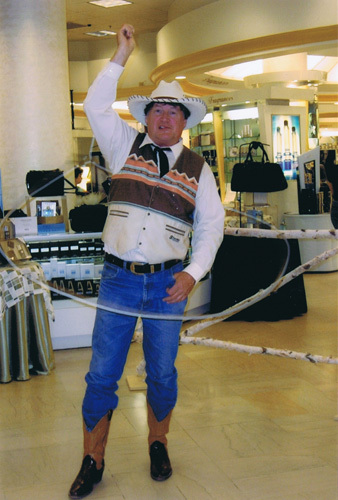 That is why he is so good at it, why most of his work is repeat or referral, and why customer satisfaction is so important to him. 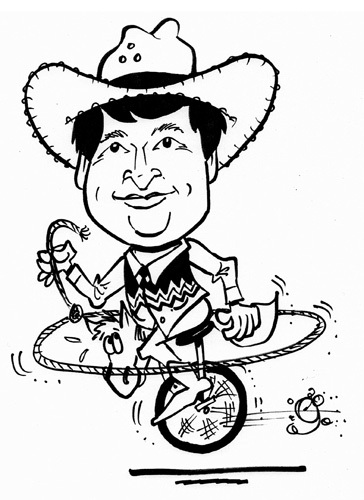 Please contact him for a free no obligation quote.